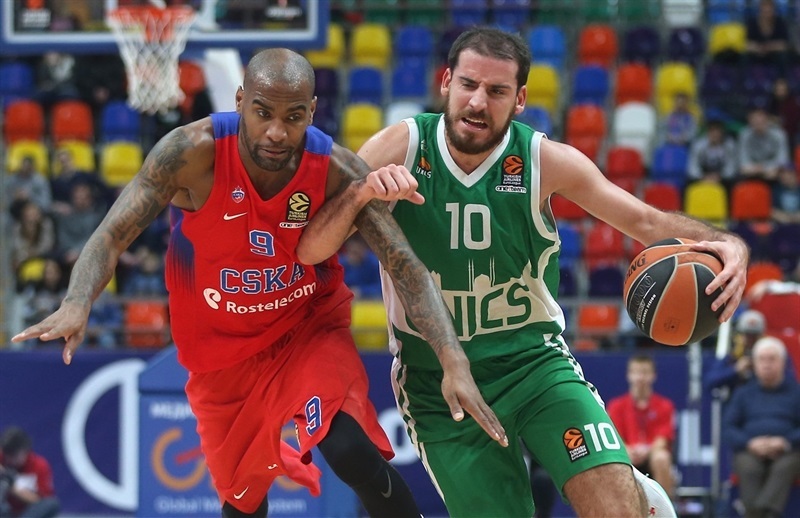 Reigning Turkish Airlines EuroLeague champion CSKA Moscow cruised to a convincing 98-80 victory over shorthanded Unics Kazan on Thursday night at Megasport Arena in the Russian capital. 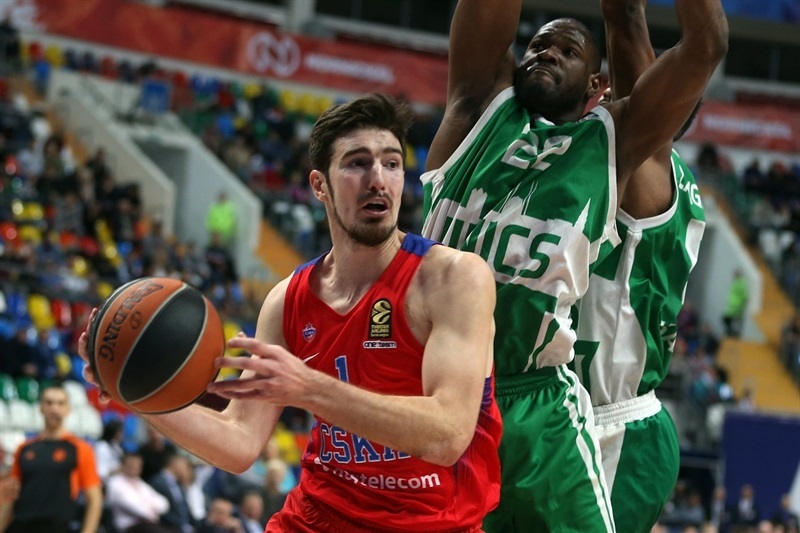 CSKA improved to 4-0 behind a balanced team effort that saw seven players score at least 8 points. 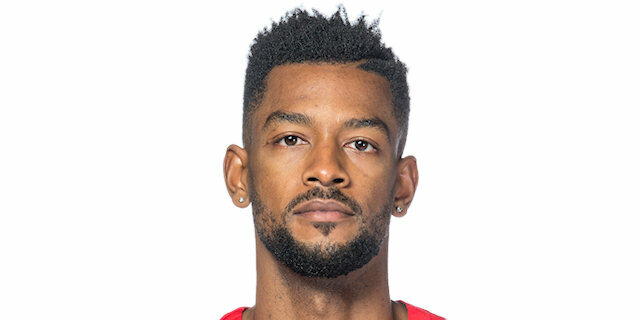 All-EuroLeague guard Milos Teodosic ran the show with 16 points and 10 assists, while Cory Higgins added 14 points, Nando De Colo 11 and Kyle Hines 10. 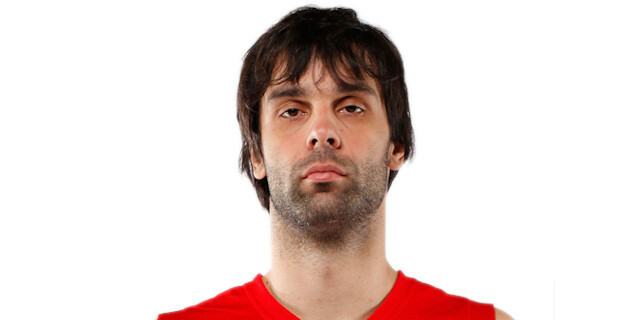 Teodosic also took over ninth place on the EuroLeague’s all-time scoring list with 2,397 points, moving past former CSKA great J.R. Holden (2,388 points). The hosts made an amazing 12 of 21 three-pointers (57.1%), including a perfect 3 for 3 by Andrey Vorontsevich. The champs also outrebounded Unics 36-25. 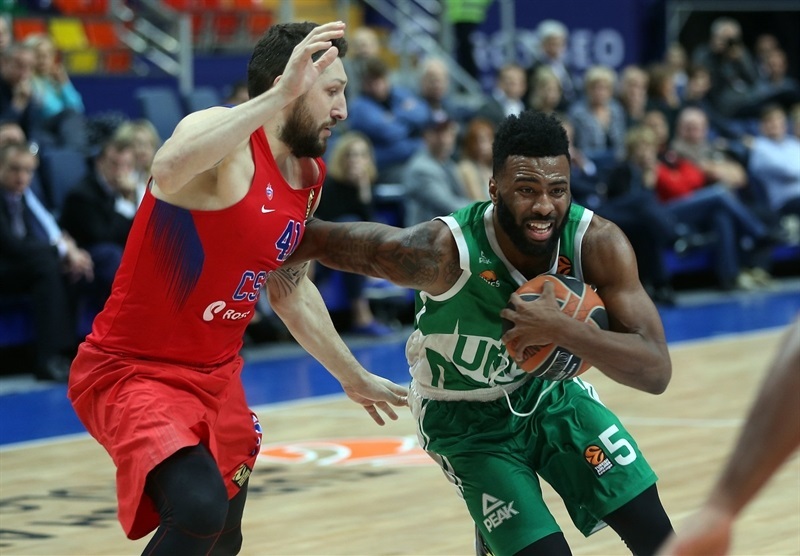 Keith Langford led Unics with 36 points, eclipsing his career high by 1. 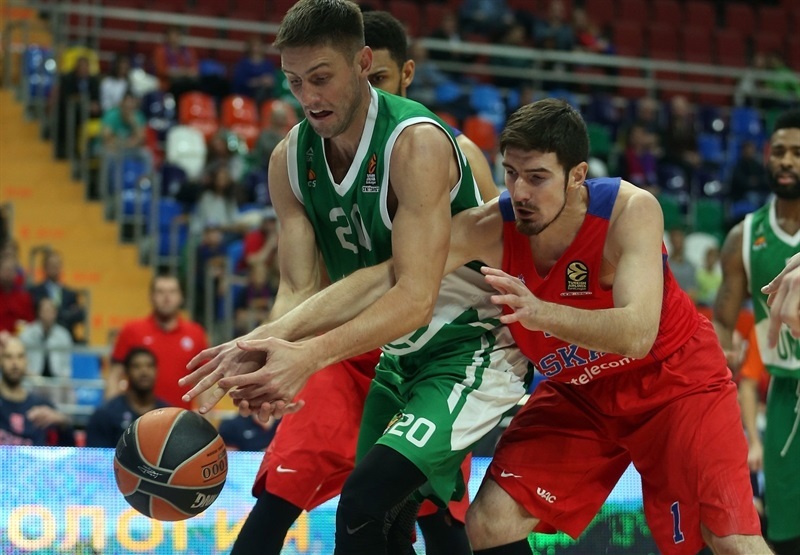 Quino Colom added 12 points and 5 assists in defeat as Unics fell to 0-4. Art Parakhouski was a force inside with a pair of blocks, a slam and 2 free throws in the opening minutes. 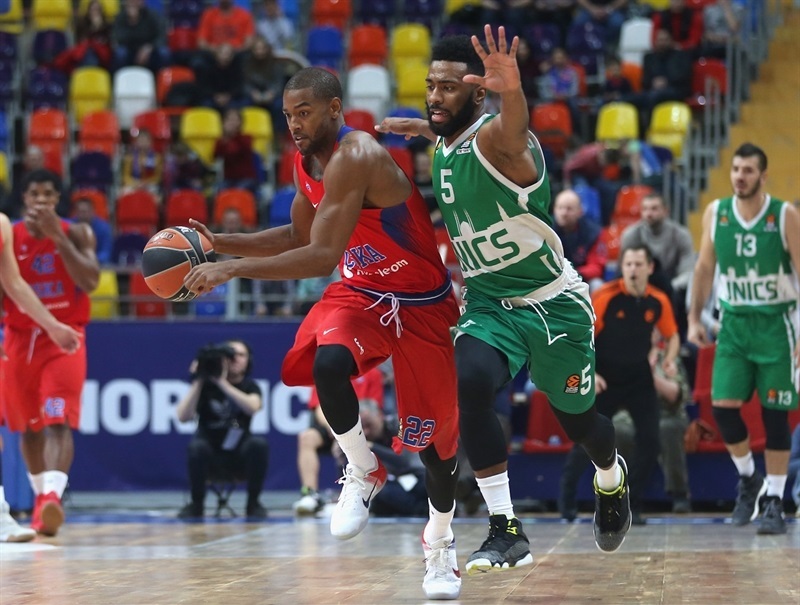 Langford got going with 9 points as the visitors took a 13-18 lead, but Higgins scored 8 points off the bench, including a three to end the first quarter that put CSKA on top 23-20. After a red-hot Langford tied the game with a jumper, CSKA scored 7 straight points to make it 34-27 midway through the quarter. 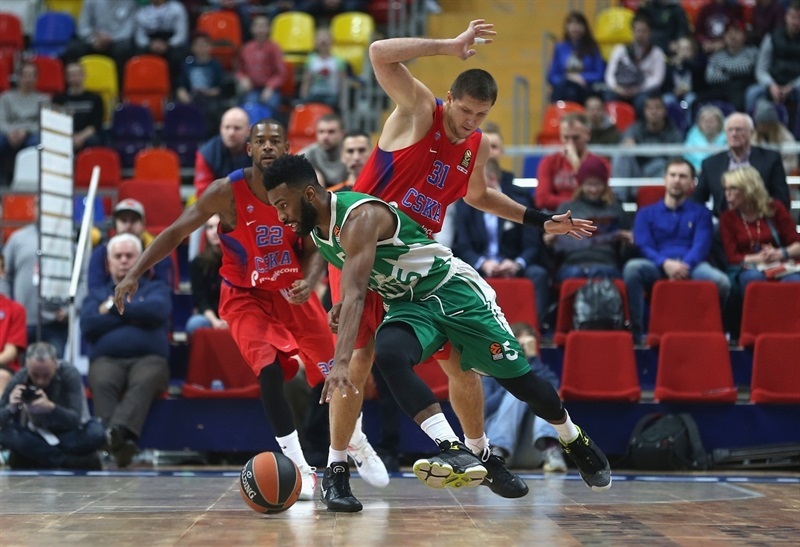 Though Unics stayed close, an acrobatic buzzer-beater by Aaron Jackson ended the first half at 47-43. 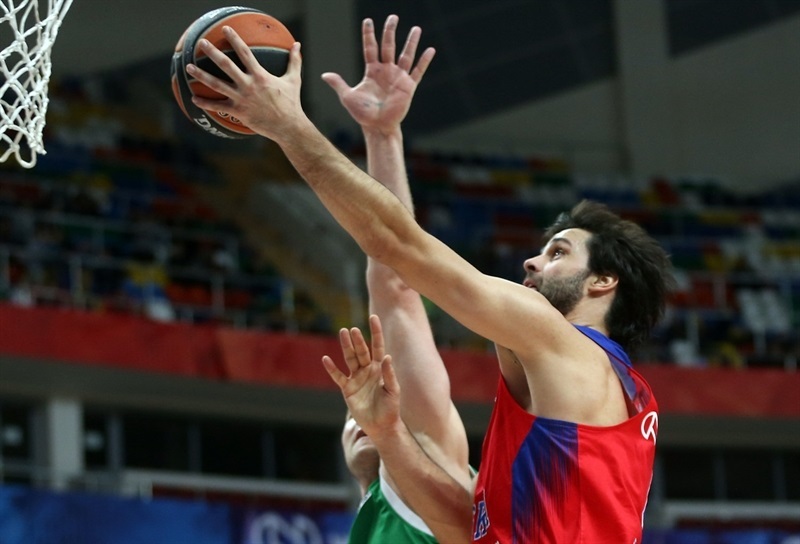 Teodosic delivered 3 assists – including on each of Andrey Vorontsevich’s 2 three-pointers – and hit a jumper in a 13-2 CSKA run to start the second half as the hosts surged to a 15-point lead, which settled at 68-55 by the end of the third quarter. 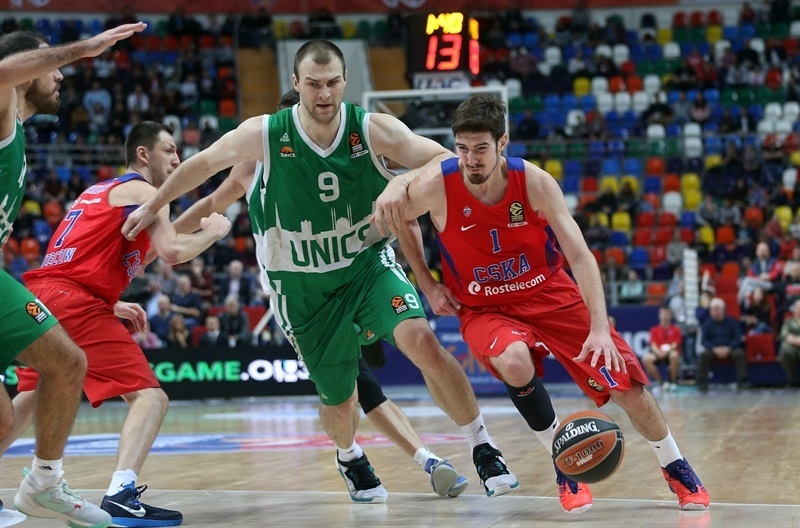 The lead swelled into the 20s in the fourth quarter as Unics ran out of steam and CSKA cruised to victory. "We do not have to forget that today was the first time we had to experience a game on the road, a tough game on the road, travel, practice and play almost back-to-back games in the EuroLeague. The thing we were trying to be focused on was energy. We tried, and I tried, to be focused and share the time and play some fresh players. The first half was more balanced because Unics’s strategy like a lot of teams against us, was to not give us the open court, to try to slow us down. We still found ways to score almost 50 points; we missed some open shots and we had unforced turnovers in the first half. We talked in halftime about our defense in pick-and-rolls and our rotations. We fixed it. We watched highlights at halftime to see what was wrong defensively why we gave up 43 points. We demonstrated good aggressiveness in the third quarter; We involved our bodies, our hands, our mobility, which gave us the rhythm and we managed to run pretty well. We managed to get a big margin and to sustain that aggressiveness and bring that game to the end." "We were more decisive in the pick-and-roll defense [in the second half], we forced the opponent into some turnovers and we had a better rhythm. Our defense gave us a rhythm. We are a team that can run better. We have to consider that Unics was missing two important players, Clarke and Ponkrashov, I wish them to come back soon, but regarding my team I have to congratulate my players. They showed a really good effort on defense in the third quarter. " "We tried to control the game in the first two quarters. 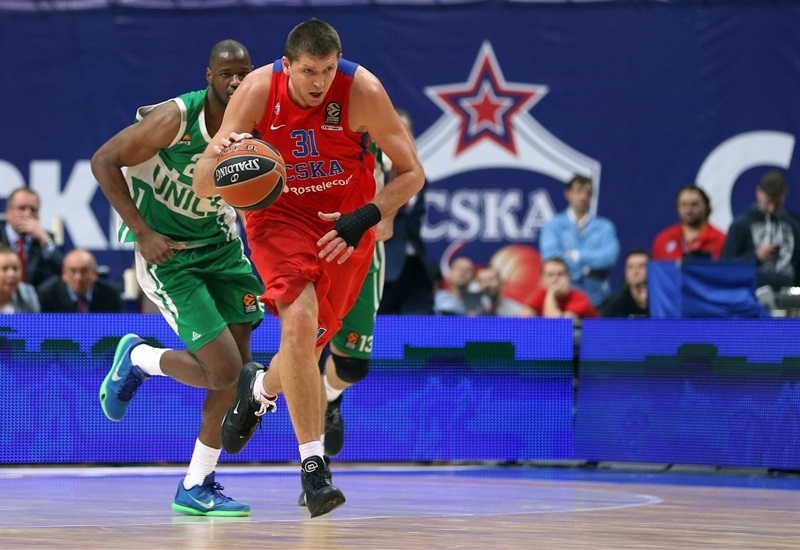 Our goal, at least defensively, in the game was not to let CSKA run too much. We did a good job on their best scorers. Our guys were focused to play good defense and we stayed close. In the third quarter we started very slow defensively and made mistakes offensively. And they got their big lead and started to dominate and we gave up. In the fourth quarter we started playing better defensively, but we still gave up 98 points. We need to improve on defense. When we allow this many points, it is not possible to win. " "We came out to the game not as focused as we should be on the defensive end. At halftime we talked about how we should make adjustments and have much more intensity. In the third quarter we showed how that should have been. 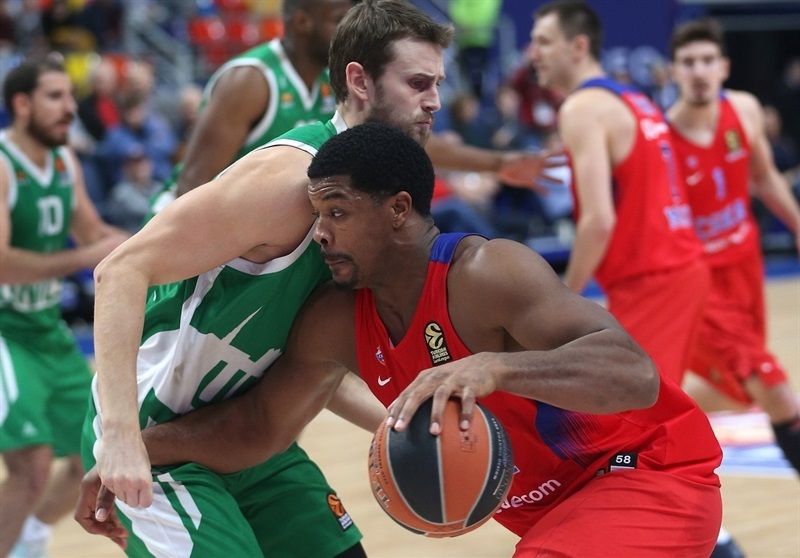 No Euroleague game is easy, Unics has Langford to their advantage." "It was a good game, good team victory especially with the circumstances of our tough previous game on the road. We played the third quarter perfectly on defense, thank to James [Augustine], Jack [Aaron Jackson] and Teo we made a step up and played really well and made a big score difference. 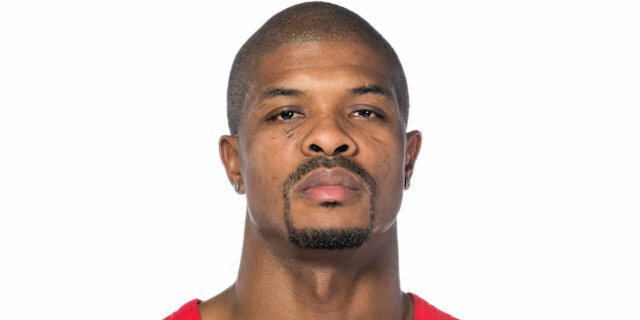 This is a good step forward in this long Euroleague journey." "In the second half we stepped up and played great defense and that’s the reason we won by 18, even though we relaxed a little bit at the end. At this point in the season, the most important thing is the win. "